Do people who feel blue as the days get shorter have to live near the equator? Thankfully not, due to the diligent inquiries of psychologists and other health-care experts. Seasonal Affective Disorder, a mood disorder that brings episodes of depression associated with seasonal variations of light, got its name in the early 1980s. Within a decade, researchers shed light in this mysterious disorder and developed a relatively simple treatment using very bright lights. Despite the advent of 24/7 electric light, humans may still be just as subject to changing patterns of sunlight as other animals, who mate or hibernate in rhythm with day length. With winter’s late dawn and early dusk, mood can suffer. Indeed, most people with SAD feel the poorest when the days are shortest, in January and February. People in the northern latitudes, especially young women, are more prone to the disorder. A small share of people with SAD show the reverse pattern, being sensitive to summer’s longer days. The very existence of opposite winter-summer patterns suggested to researchers that this mood disorder stems from a problem in adapting to the physical environment. Once SAD was identified, researchers hypothesized that its typical appearance with winter had something to do with lowered exposure to sunlight. The obvious next step was to lengthen exposure to light intensity more akin to outdoor levels; it worked. By 1998, researchers including were studying treatment variations. In a key four-week study, Eastman and her colleagues randomly assigned 96 patients with winter SAD to one of three bright-light treatments that are about 10 to 20 times brighter than ordinary indoor lights. Patients either got an hour and a half of bright light in the morning, an hour and a half in the evening, or a morning placebo of two deactivated negative-ion generators. After three weeks, significantly more people in the morning light treatment group than in the placebo group showed significantly more complete or near-complete remission of their symptoms. The response to evening light was also better than placebo, but not at a level of significance. Importantly, Eastman’s group found that effective phototherapy fostered full remission of depression, a prized goal for a disorder that often seems to come back after treatment. Other studies have assessed bright-light’s side effects and probed the biological bases of Seasonal Affective Disorder. Side effects are usually mild; light therapy can make people mildly jumpy and create headache and nausea. Other researchers report that women with SAD may be more vulnerable to the amount of light they get, because although they don’t spend less time outdoors than other women, they do spend more time outside in the summer, resulting in a larger overall change between seasons. Finally, scientists continues to probe not only why some people are more vulnerable to SAD than others, but also how seasonal changes in light shape mood via its impact on the brain. Research centers around the way high-intensity light reaches the pineal gland in the middle of the brain, which secretes melatonin – the “jet lag” hormone that helps to regulate biorhythms. 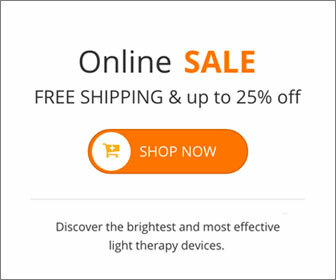 For the estimated half a million people in the United States who may experience winter depression, bright light therapy, known as phototherapy, is now commonly prescribed. During phototherapy, patients sit facing a “light box” with a bank of fluorescent bulbs of up to 10,000 lux total intensity for about a half hour per session throughout their low season. They can’t wear or use anything that blocks the ability of the light to pass through the retina and stimulate the the brain’s suprachiasmatic nucleus (SCN), it’s circadian clock. Light goes there first and then on to the pineal gland. For people whose symptoms are mild, outdoor time – perhaps an hour’s walk under the winter sun — or greater indoor exposure to sunlight can help. As a result of ongoing research into SAD, psychologists diagnosing patients with depression can take into account whether the symptoms come and go with the seasons. If they do, phototherapy is a validated treatment for brightening things up. This entry was posted on Thursday, May 1st, 2014 at 9:15 am	and is filed under SAD. You can follow any responses to this entry through the RSS 2.0 feed.